Dream Pod 9's latest ebook only exclusive entitled Lion's Wrath - Northern Army List is now available. 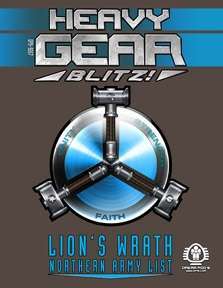 This is an abridged version of the delayed Lion's Wrath - Northern Field Guide, for players of Heavy Gear Blitz's Northern faction. Lion's Wrath includes everything you need to make a Northern army, with new vehicles, datacards, updated combat groups and threat values. Choose one of the Confederated Northern City States (CNCS) five army options from the Northern Guard (NG), Northern Lights Confederacy Armed Forces (NAF), United Mercantile Federation Army (UMFA), Western Frontier Protectorate Army (WFPA), Northern Territorial Reserves (NTR), or make a Generic Northern Army. This title was added to our catalog on May 29, 2014.